According to data released by the U.S. Bureau of Labor Statistics on Tuesday, if you’ve noticed you’re spending more on everyday necessities such as food, shelter, clothing, and gas, you are correct. The Consumer Price Index (CPI), which measures the costs of consumer goods and services purchased by households and is arguably the best measure of inflation, increased by 0.3% in June, following a 0.4% increase in May. The price of gas accounted for two-thirds of the gain, and food prices have now seen increases for six straight months. 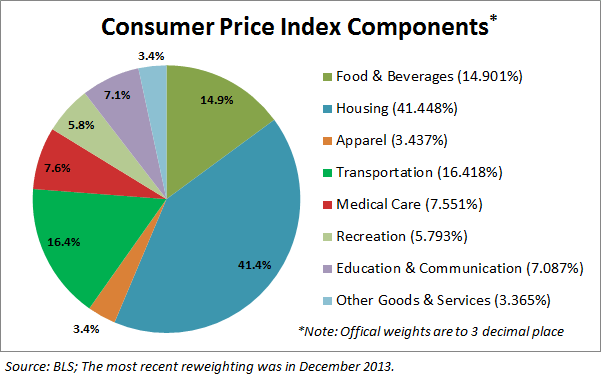 For more information on the consumer price index, read “What Inflation Means To You: Inside The Consumer Price Index” on Seeking Alpha. Inflation has been steadily creeping upward as the economic recovery has become more constant, leading economists to predict we will reach the Federal Reserve’s target of 2% inflation by the end of 2014, especially as job growth drives wages higher. Recall that Fed chairwoman Janet Yellen announced last week that the Fed may raise interest rates sooner and by a higher percentage than originally planned, as the economy has improved faster than they expected. As inflation edges higher, remember that gold has historically been used as a hedge against inflation and tends to increase in value as inflation rises. A dollar in 2014 does not buy what it used to in 2000, while gold buys more. If you’d like to use the benefits of owning gold to protect your retirement assets, call American Bullion at 1-800-326-9598 and ask about adding gold to your retirement account by opening a Gold IRA.